This summer was filled with oodles of handsome boys! This little guy was no exception! 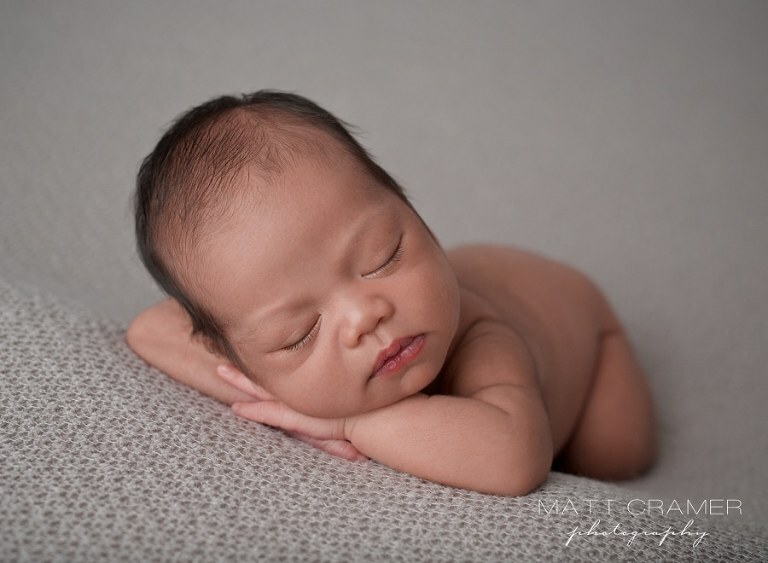 With his gorgeous skin tone and those long awesome eyelashes, we couldn’t wait to capture this sweet boy! He was super sleepy and flashed us so many smiles. Made our jobs a breeze! Meeting his equally awesome parents was really the icing on the cake, too. Mom and Dad are some of the nicest and most down to earth people you will ever meet! After the session, we spent time sharing stories about our love of Mammoth! One of our favorite places to visit year round. Anyways, enough about us and more about this adorable baby. His photography session went so incredibly smooth. Here are some of our favorites. 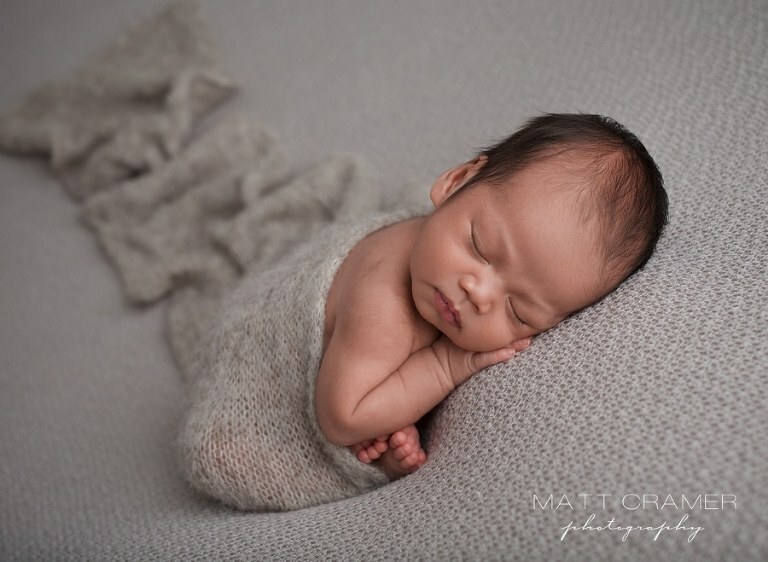 (Newborn Photography Shoot Los Angeles). This over the shoulder angle is a parent favorite and I love how beautiful it looks in black and white. In our pre-session questionnaire, Mom mentioned she loved lots of gray, cream and blue tones. Starting with a light grey textured fabric, we captured some of our simple and clean looks. He posed perfectly for this shot. Sleeping so soundly, I gently guided him into this sweet pose that shows off baby’s face. Always another favorite for parents. After we finish with our clean fabric shots, we always move on to our props. I love the way blues and grays against the lighter white wash wood flooring comes out. The little hat he is wearing is probably our #1 requested boy hat! Details like these are so wonderful to document. 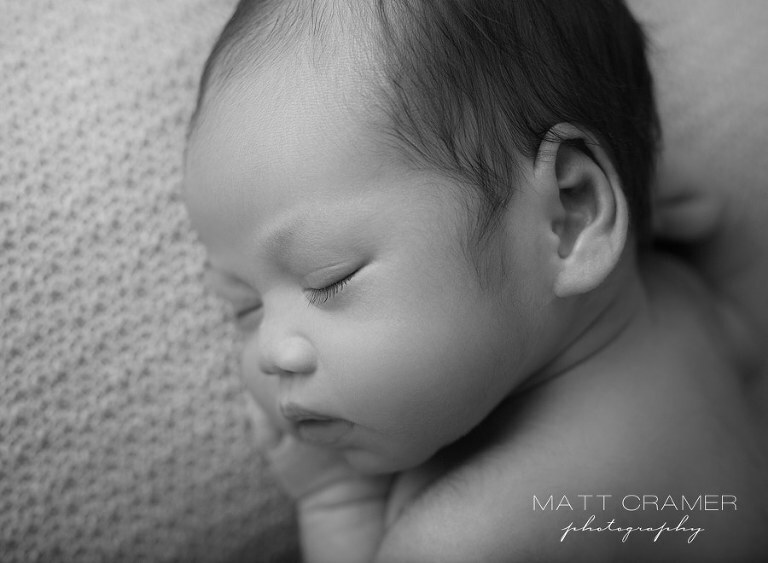 This eyelash shot is one of Matt’s personal favorites to get. Whenever we can capture a cute little smile we get super excited knowing how much parents will love! Everything about this image is goals for us! The light casting off his skin so evenly and soft. All cream set ups are a favorite of mine, and this one looked exceptionally gorgeous on him. 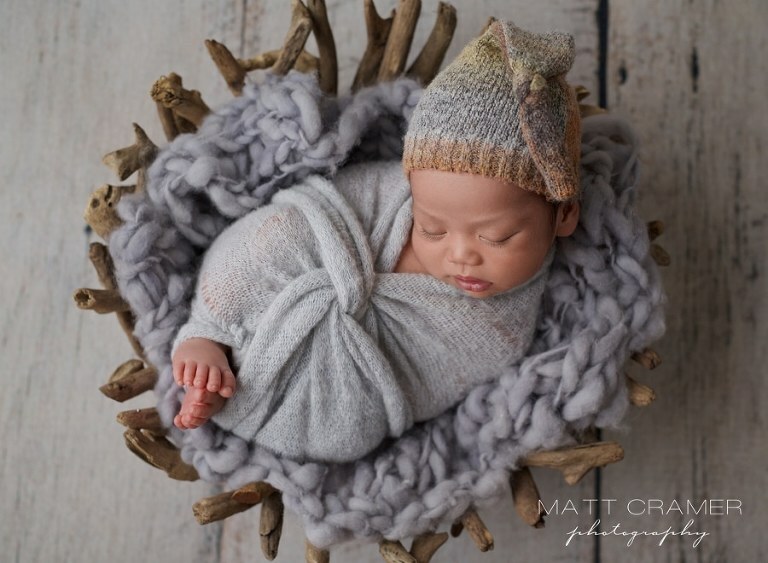 A favorite hand knit sleepy hat from Baby Le Cradle is my go to! This image is hands down my favorite from the entire gallery! He fits so perfectly in this rustic wood bowl from Freebird Prop Shoppe. Aerial shots convey such an artistic feel, we just love them! Hi Beautiful Boy! Hope to meet you soon! Naks!!! !…cute nmn si Koa bear!